Wild thang.. you make my heart sing.. Oh.. you make everything, grooooovy..
but as most of us know there are some specific rules to follow when worrying about a growing fetus. Trust you me, I’ll be slamming some sushi after baby girl gets here! 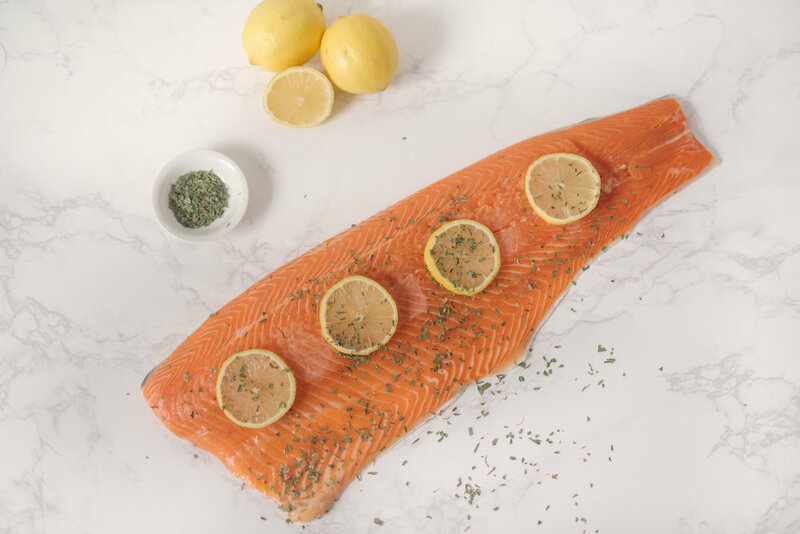 So here’s my favorite low fodmap, gut friendly Lemon Tarragon Salmon and below that you’ll find the science on why you need to choose WILD CAUGHT over farm raised! As well as the “rules” to fish while pregnant. 2. I always use a silicone liner in my rimmed baking sheet when I’m cooking fish because it makes clean-up so much easier. 3. You could also line with tin foil or parchment paper, or simply grease the baking sheet with a high smoke point fat like tallow, palm shortening, or avocado oil. 4. Combine your finely chopped tarragon, lemon zest, salt and pepper. Sprinkle over the top of your salmon (you won’t be flipping your fish, so no need to do both sides; if your salmon has skin on one side, place that side down on your baking sheet and season the other side). 5. Bake for 15 minutes, until opaque throughout and segments flake apart easily. Serve with fresh lemon to squeeze over the top and enjoy! Hello selenium! This trace mineral is necessary for your thyroid to work properly!! If you’re deficient in it then you may see weight gain, hypothyroidms, Hashimoto’s thyroiditis, goiter, Graves’ disease , infertility, hair loss and even brain fog!! Packed with free radical fighting Astaxanthin! As a member of the carotenoid family of antioxidants, astaxanthin gives salmon its red pigment. Astaxanthin is a powerful antioxidant that will help with premature aging, goodbye wrinkles and also help improve your overall health! Rich in Omega-3 fatty acids. This is going to help with managing a healthy weight, brain health and lowering inflammation. Lot’s of protein to help maintain and build lean muscle. A serving of salmon has more potassium than a serving of banana! It’s great to eat if you’re packing on any water weight, need electrolytes and for lowering blood pressure. Both fatty fish and fish oil have been found to reduce depressive symptoms, protect fetal brain health during pregnancy, decrease anxiety lower the risk of dementia and slow age-related memory loss. I snag a frozen bag of wild salmon from costco or if I'm making it that day, I'll snag some fresh wild salmon. Honestly, if you can’t eat wild fish, it’s probably better to not eat fish at all. Now why is WILD so much healthier than farmed? Farmed fish have more fat but less Omega-3s which are the anti inflammatory fats your body’s needs, they’re also contaminated with PCBs, antibiotics, and other contaminants and fish farming has serious environmental consequences. While wild fish is way better for you and for our planet. Whether you’re buying salmon, trout, shrimp – or any other kind of seafood just make sure it is wild. Here's the thing, eat too much fish and you may be drenching your baby in excess mercury, a toxin known to impair fetal brain development. Eat too little fish, though and you'll deprive your lil critter of precious omega-3 fatty acids, which enhance not only brain development but just fetal growth in general. Have two to three fish servings per week, experts say it is safer to stick to a more limited list of 17 types of low-mercury fish and avoid very high-mercury fish altogether. Here’s my recommendations! Lowest-mercury fish: oysters, salmon (wild and Alaska, canned or fresh), sardines, scallops, shrimp, squid, and tilapia. • A 132-pound woman can safely eat up to 36 ounces per week; a 44-pound child can safely eat up to 18 ounces. Low-mercury fish: Atlantic croaker, Atlantic mackerel, catfish, crab, crawfish, flatfish (flounder and sole), haddock, mullet, pollack, and trout. • A 132-pound woman can safely eat up to 18 ounces per week; a 44-pound child can safely eat up to 6 ounces. Fish to avoid: bigeye tuna (often used in sushi), Gulf tilefish, king mackerel, marlin, orange roughy, shark, and swordfish. • These fish are too high in mercury to be safe for women of childbearing age, those who are pregnant or breastfeeding, and young children. Thanks for visiting my space on the internet. For more gut friendly, low FODMAP recipes check out my recipe book The Gut Refresh. Tag me if you make my Lemon Tarragon Salmon and I’ll repost it!